The baseball all star figure that tops this trophy is shown in full swing after hitting it over the fence. The unique all star riser in the middle sets a dynamic tone for the overall award. The black marble color finish base completes this award trophy. 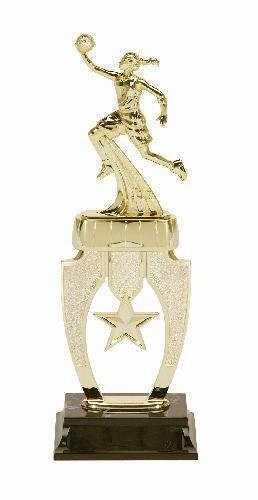 Baseball Action Snap - 13"
The basketball all star figure that tops this trophy is shown with the basketball in one hand while gliding through the air to delivery a picture perfect layup. The unique all star riser in the middle sets a dynamic tone for the overall award. The black marble color finish base completes this award trophy. 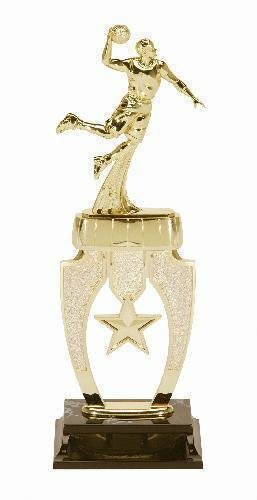 Basketball Action Snap Female - 13"
A full color hardwood court, highly detailed back board, and a basketball highlight the middle of this award trophy. 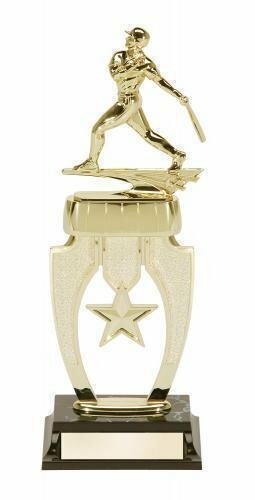 The top of the award features a player with ball in one hand gliding through the air on his way to make a slam dunk. The black marble color base finishes this award trophy. Basketball Action Male - 13"
The basketball all star figure that tops this trophy is shown with the basketball in one hand while appearing to fly through the air to give an incredible slam dunk. The unique all star riser in the middle sets a dynamic tone for the overall award. The black marble color finish base completes this award trophy. Basketball Action Snap Male - 13"